Children have been recorded as starting to walk as early as 7 months old. 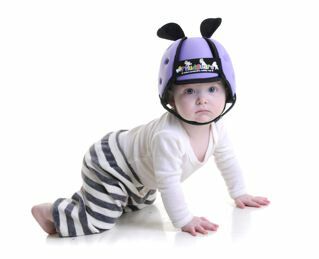 With this in mind Thudguard was designed to accommodate a small head size of 40cm circumference but may cover the child’s eyes if not positioned correctly. This is easily put right by resting the hat further back on the head to allow a clear view. The chinstrap will keep it in this position. Keep checking that the hat has not been knocked forward or that the child has not pulled it forward. Always make sure that the child can see where she is going.